"It is the whole world, not only Orléans and France, which venerate God’s acts accomplished through Joan of Arc. They adimre the piety and enthusiasm of this young girl, the purity and unbending self-denial with which she always carried out the will of God. And they have noted the holiness which crowned her life both in Domremy, where she tended her father’s cattle as a modest peasant girl, on the battlefield where she showed the skill and courage of a great captain, and at the stake where she displayed her unswerving loyalty to the Christian faith and the Apostolic See. The Popes of Rome have already defended and praised this admirable heroine, and it is the general wish that Your Holiness now honor and exalt her memory. This would show particular tribute to Joan’s memory, who in freeing her country also saved it from the heresy which might have become a danger in the future. It would also honor the French people, who have done so much for religion and for the throne of Saint Peter." Decree concerning the Orleans cause for the Beatification and Canonisation of the Venerable Servant of God, Joan of Arc, Virgin known as the Maid of Orleans. The Question being Should the commission for the introduction of the cause in the circumstances and for the purpose in question be signed? God, who as the Apostle says, "calleth those things which be not as though they were," as in former times he had, in his designs chosen Deborah and Judith to confound the mighty, at the beginning of the fifteenth century raised up Joan of Arc to restore her country's fortunes which had been almost destroyed by the desperate war between the French and English and at the same time to reclaim the liberty and glory of afflicted religion. She was born in Lorraine on the 6th January 1412 of parents who were of humble station but remarkable for their traditional piety. Trained, in good morals she was distinguished from her earliest years by every Christian virtue and especially by the angelic chastity of her life. While still a little girl fearing God in the simplicity and innocence of her heart, she assisted her parents in their rustic labours; in the house her fingers worked the spindle in the fields she followed her father and sometimes willingly drove the plough. Nevertheless the pious child was daily growing in heavenly grace. When she had attained the age of seventeen, it was made known to her through a vision from on high that she must go and seek Charles the Dauphin of France to reveal to him a secret which she had received from God. The good and simple maiden sustained only by the spirit of obedience and animated by a wonderful charity at once put her hand to the great work, and having left her country and her parents and gone through the innumerable dangers by which her road was beset appeared before the king at the town of Chinon, and with a frank and virile spirit disclosed to him and to him alone what she had learned from heaven. She added that she had been sent by God to deliver the besieged city of Orleans, and then to conduct the prince to Rheims, where Jesus Christ being proclaimed Supreme King of France, Charles would receive in His place coronation and the insignia of royalty. The king marvelled when he heard these things but in order to proceed with the greater prudence and safety in so important a matter he sent Joan to Poitiers to be examined by a committee of most illustrious men assembled there among them being the Archbishop of Rheims, chancellor of the kingdom, the Bishops of Poitiers and Maguelone and eminent doctors, both of the secular clergy and of the regular clergy. All these men shortly afterwards agreed in sending Joan back with a striking testimonial addressed to the king in which they testified to her faith piety simplicity and virginity and acknowledged her divine mission. And then, to the wonder of all beholders, this young girl who knew the use of neither helmet nor buckler, mounted a horse, brandishing in one hand a sword and carrying in the other a standard whereon was depicted the image of the Redeemer, plunged into the fatigues and perils of war and fearlessly sprang into the midst of her enemies. 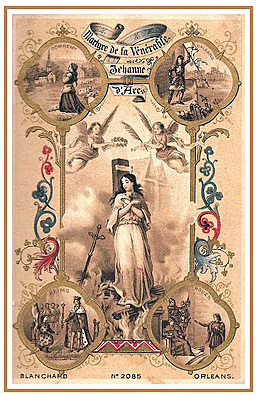 It is difficult to realize her bravery in action and her patience in bearing the insults and mockery of her foes, and the tears and fasts and prayers which she offered to God first of all to obtain the deliverance of Orleans, and then, after other victories of the French arms, when she had restored and secured the kingdom's rights to remove from the future with the help of God all the dangers which threatened the public peace and prosperity or were able to disturb the religion of her ancestors. Always accompanied by her confessor, Joan took every means to remove from the army whatever might corrupt morals or incite to evil, and had recourse to the holy priests to encourage the piety of the soldiers. But the most powerful means of all was the example of the Maid herself who was almost angelic in the exercise of all the virtues and especially in the love which animated her for God and for her neighbor. This love was so strong even towards enemies that not only did Joan never wound anyone with sword or lance, but, to the wonder of all who beheld her, she raised succoured and cared for the wounded enemies whom she saw stretched upon the ground. At last bearing everywhere the part of an active leader, she raised the siege of Orleans and brought peace to the terrified inhabitants. To Joan should also be attributed the fact that the whole country watered by the Loire, the territory of Troyes and the city of Rheims, where at length the Dauphin Charles was solemnly crowned returned to their allegiance to the king. In return for so many and such great services, all kinds of suffering were, by the will of God, who wished to prove his servant, inflicted upon the Maid. Abandoned or betrayed by her own friends, she fell into the cruel hands of her enemies who sold her for a money price. Loaded with chains and tortured day and night in her prison in a thousand ways, she was at length, by a crowning crime burned at the stake as one tainted with heresy and a backslider-the iniquitous sentence of judges who were in league with the schismatical Council of Basle. Fortified by the Sacrament of the Holy Eucharist, in the midst of the flames she kept her eyes fixed upon the cross and ceaselessly repeating the name of Jesus won the precious death of the just. Her death, which, according to report was signalized by heavenly prodigies, excited to such a degree the admiration of those who witnessed it that her enemies were terrified. Several returned from this horrible spectacle striking their breasts. The executioner publicly declared the innocence of the Maid whose death he had caused. Men came to their senses, communed with themselves, and upon the very scene of the execution began to venerate the saintly character of Joan. It was to prevent the people from keeping relics of her that her ashes and her heart, which had remained untouched in the midst of the flames and from which the blood was still flowing, were together thrown into the river by her enemies. When Charles VII had recovered possession of his kingdom and order had been restored in the public affairs of France, Pope Calixtus III, upon the petition of the mother and brothers of Joan herself, appointed apostolical judges to revise the trial by virtue of which the Maid had been condemned to the stake. These judges, after having heard a hundred and twenty witnesses of all ages and conditions of life, pronounced a judgment on the 7th July 1456, by which the former sentence was annulled and the Maid's innocence was declared. The fame of her saintliness having been confirmed during four centuries without interruption, it finally came to pass, in our own time, that the customary enquiry into this reputation for saintliness and virtue was held in the ecclesiastical court of Orleans. This enquiry having been duly carried out and forwarded to the Holy Congregation of Rites our Holy Father, Pope Leo XIII, was pleased to allow that the question as to the signature of the commission for introducing the cause of the servant of God should be submitted and it was submitted at the ordinary meeting of the same Holy Congregation. Consequently, at the instance of the Right Reverend Bishop of Orleans and of the Right Reverend Arthur Captier, Superior General of the Society of St Sulpice, the postulator of the cause, and after a consideration of the letters in support written by a great number of Most Eminent and Right Reverend cardinals of the Holy Roman Church, and bishops not only of France but of diverse distant countries, letters to which a great many leading members of the clergy, and as it were the entire Catholic world ,have given their adherence at the ordinary meeting of the Holy Congregation held at the Vatican on the day mentioned below, the following question was proposed for discussion by the Most Eminent and Right Reverend Cardinal Lucide-Marie Parocchi Bishop of Albano and Reporter of the cause, namely: Should the commission for the introduction of the cause in the circumstances and for the purpose in question be signed? And the said Holy Congregation, having maturely weighed all the facts and having heard the Reverend Father Augustin Caprara, Promoter of the Holy Faith, thought fit to reply: The commission ought to be signed if it please His Holiness, 27th January 1894. All these things having been reported to our Holy Father Pope Leo XIII by me, the undersigned, cardinal prefect of the said Holy Congregation, His Holiness, ratifying the rescript of the Holy Congregation, has deigned to sign with his own hand the commission for the introduction of the cause of the Venerable Servant of God, Joan of Arc, Virgin, on the same day of the same month of the same year.